Address: 4979 East Valley Dr. I knew I was starting out on an adventure when i took over the operation of a 3rd generation asphalt and paving company in 1987. Back then all I had was a roller and a 1 ton dump truck, today we are a fully established family oriented and owned business with a reputation I am proud to put my name on. People as why my motto is “It’s not just a business, it’s my name”. The answer is: I want all of my customer’s to know that I take a personal interest in the smallest details. Every job completed by Richard Diehl paving has my name on it! This is why most of our business comes from referrals and repeat customers. My business is personal to me. If I see a customer outside of work, I can walk up and shake hands confidently, knowing I did my best for them. 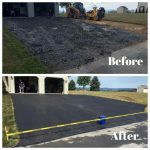 Whether your needs are residential or commercial, Richard Diehl Paving will provide its reputation.